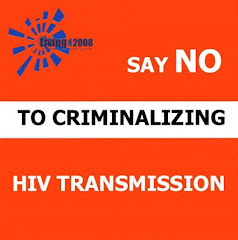 Two disturbing case reports this week - one from Uganda and one from Australia - highlight the dangers that HIV-positive people face when they disclose (or when others disclose) their HIV status. In Uganda, a man allegedly hacked his wife of 10 years to death with a machete after he found out he was HIV-positive and blamed his infection on his wife. Report from The Daily Monitor below. And in Australia, a man stabbed and killed his mother's boyfriend after hearing allegations that he was HIV-positive, even though it's not clear that he actually was. Report from The Australian below. UPDATE November 24th 2008: A jury has found the Australian man guilty of manslaughter and he was today sentenced to a minimum of five years in jail, according to a report from The Sydney Morning Herald. The Australian reports that "the jury found him not guilty of the more serious charge of murder..."
Police in Rukungiri have arrested a man who allegedly killed his wife of 10 years by hacking her with a machete after he learnt he was infected with HIV, the virus that causes Aids. The police identified the suspect as Mr Julius Tumwesigye, 30, and said he blamed his infection on his wife. According to the officer-in-charge of crime in the area, Mr Jackson Mugisha, the suspect stabbed his wife, Glorius Kyarikunda, 25, at 10am on Tuesday in Kikarara Trading Centre in Bwambara Sub-county, Rukungiri District. The couple had two children aged six and four. Residents, who spoke on condition of anonymity, told Daily Monitor that Kyarikunda had fled to her parent’s home on Sunday after a fight with her husband. The attack is reported to have occurred two days later when Kyarikunda returned with the children to collect her property and found an enraged Tumwesigye. It was at that point that Mr Tumwesigye allegedly pounced, hacking her to pieces. She died moments later. Mr Tumwesigye, who was by now drenched in his wife’s blood, attempted to run but neighbours, who had been drawn to the homestead by Ms Kyarikunda’s screams, arrested him. It was the timely intervention of the Police that saved him from the mob that was baying for his blood. A blood-stained machete was recovered from the scene of the crime. A post-mortem report showed that the deceased died from deep cuts inflicted by sharp object. Mr Mugisha told Daily Monitor, that such murders seldom happen in Rukungiri. “It is the only murder of the kind that I can recall in a long time,” he said, in a telephone interview. However, murders generally have been on the increase in western Uganda. Several weeks ago, a mentally ill man in Bushenyi hacked his family of six to death before killing himself. A well known HIV, gender and human rights activist, Dr Lydia Mungherera, who lives openly with HIV, yesterday condemned the attack and called for swift justice. “It is horrific that a woman is hacked to death on being blamed to have infected a man with HIV,” Dr Mungherera said. “No one knows who infected who in this case. It has become a common practice for women to be blamed in society as the cause of the pandemic. It is very bad to hack a person you have been living together with for long.” Tumwesigye had, by yesterday, not yet been charged. Dr Eugene Kinyanda, a consultant psychiatrist with the Medical Research Council said Mr Tumwesigye’s act could be due to lack of counselling services in the area. About a million people in Uganda are living with HIV but activists warn of increasing attacks, especially within homes. At a recent workshop held in Soroti, the Regional Manager of the charity ActionAid Uganda, Ms Ann Akwango, said violence against women living with HIV and Aids is increasing and revealed that statistics from Pallisa District had indicated 100 out of 465 HIV-positive women questioned during a survey earlier this year, had experienced some form of violence after revealing their status to their husbands. It is feared that this type of violence will scare partners from revealing their status, drive the epidemic underground and lead to increasing infection and deaths from people afraid to seek professional care and support. A SYDNEY man has admitted to stabbing but not murdering his mother's boyfriend after hearing claims her lover was HIV positive, a jury has been told. In the Crown's opening address in the New South Wales Supreme Court today, Chris Maxwell QC said Jason Podesta had admitted stabbing Steven Bannister on November 22, 2006. But, he said, the issue for the jury would be whether Mr Podesta had a "substantial mental impairment'' at the time, which would enable him to be found guilty of manslaughter. Mr Podesta, of Liverpool and who was 19 at the time of the killing, has denied murdering Mr Bannister. Mr Maxwell said the Crown believed the jury would return a verdict of murder. The body of Mr Bannister, dressed only in tracksuit pants and joggers, was found on the footpath at Casula, in Sydney's southwest, on November 22, 2006. Mr Maxwell said Mr Podesta's mother, Cathy, who was in her early 40s, had been in a relationship for at least several years with Mr Bannister. He said mr Podesta told police his mother received a number of apparent prank phone calls on her mobile phone the night before 24-year-old Mr Bannister's death. "The calls related apparently to the sexual activities of Cathy Podesta's boyfriend, Steven Bannister, and included ... that it was believed he was HIV positive,'' he said. Mr Maxwell is continuing his opening address before Justice Lucy McCallum.